Syria's Directorate-General for Antiquities and Museums (DGAM) is hoping to begin restoration works for monuments in the city of Palmyra after many of them were destroyed or damaged by Daesh terrorists, the agency’s head said Saturday. MOSCOW (Sputnik) — The Syrian army’s offensive on the city of Palmyra to recapture it from Daesh terrorists began on Thursday. On Friday, the units of the Syrian army and patriotic militia retook the historic Palmyra Castle from Daesh terrorists, reports said. "I think we shall start working in April, when the city will be completely safe. Experts on the ground will look over the situation and assess destruction [of monuments]," Maamoun Abdulkarim told RIA Novosti. According to Abdulkarim, the experts are intent on completely restoring two temples, the 2,000-year-old Roman arch of triumph and funerary towers which were destroyed by the jihadists. Palmyra is considered key for advancing to Daesh stronghold of Raqqa in eastern Syria. The city of Palmyra and its historic ruins have been under Daesh control since May 2015. 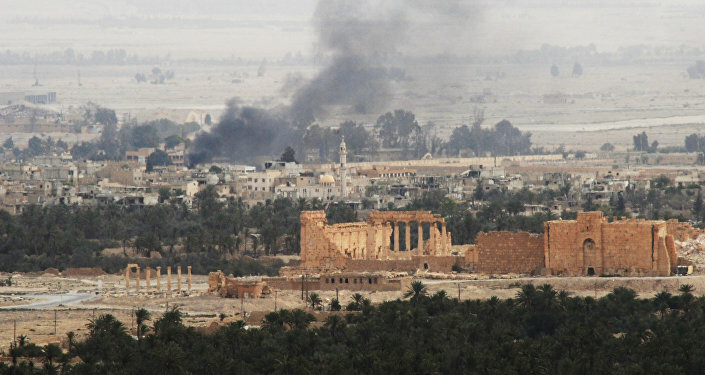 The terrorist group has since destroyed part of the ruins, which are a designated UNESCO World Heritage site.